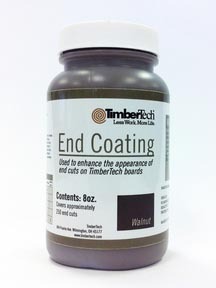 Coat the ends of your TimberTech® deck boards with our tried and true end coating. Tested to withstand the toughest environmental conditions, TimberTech end coating is formulated to work with all TimberTech deck boards. An 8 oz. bottle covers roughly 250 ends, and is easily applied with a brush or roller. Scratches and nicks will weather to a similar match in 8-10 weeks; the time frame will vary based on exposure and climate. Surface scratches on the fence boards, rail and the 5-1/4" x 5-1/4" post may be repaired by applying heat to the surface - check out the full answer to this question to read more about blending scratches and cuts.